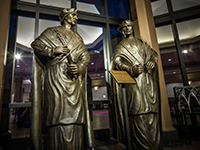 On Tuesday, September 26, faculty and staff representing the Duquesne University School of Pharmacy will gather to attend a Noon Mass in celebration of the Feast of the patron saints of pharmacy, Cosmas and Damian. The Mass, which will be celebrated by Rev. Daniel Walsh, will be followed by a prayer service in the Bayer Learning Center Rotunda, where replicas of the saints can be found. The statues have been dipped in bronze and spotlights have been erected to make them more visible to students and visitors to the building. Saints Cosmas and Damian were twin brothers of Arabian descent and devout Christians. The collaboration of the health professions, Pharmacy and Medicine, is nowhere more strikingly portrayed than by Damian, the apothecary, and Cosmas, the physician. As stated by J. Douglas Bricker, Ph.D., Dean of the School of Pharmacy, the saints "dedicated their lives to helping those who could not afford medical attention, and it fits very well with the mission of Duquesne University, as well at the mission of the School of Pharmacy, which is to improve health outcomes in patients in the community.